2017 Honorary Doctorate Honorees. Photo: Chen Galili. 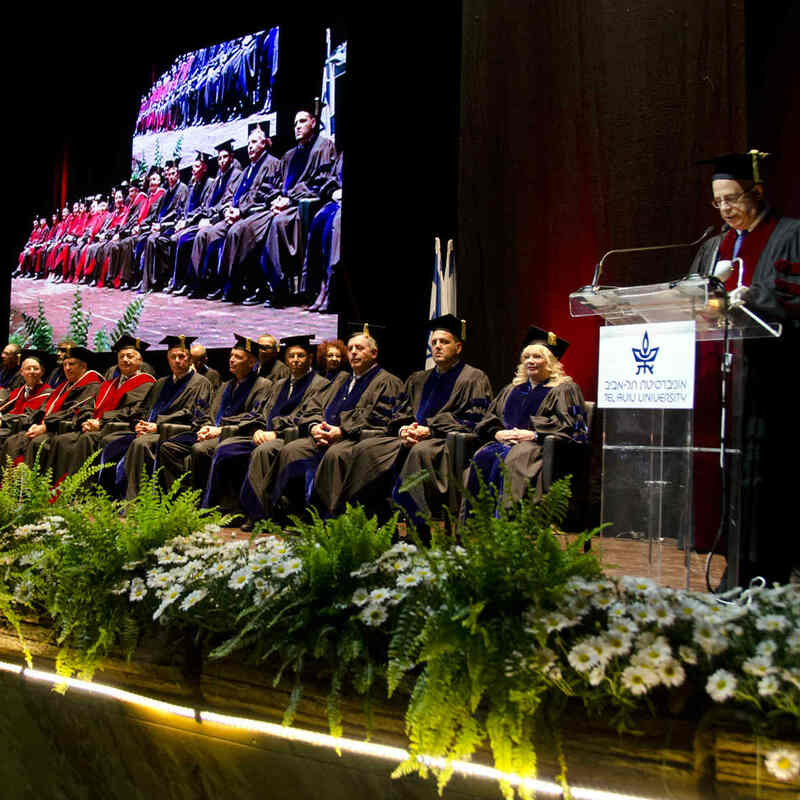 In a lively ceremony held during the 2017 Board of Governors Meeting, Tel Aviv University conferred its highest awards on a remarkable group of figures in recognition of their professional and philanthropic contributions to society and their staunch support for the State of Israel. Chairman of the Board of Governors Prof. Jacob A. Frenkel opened the evening’s proceedings, noting that education is the key to addressing gaps in economic growth. “Education creates a better and more equitable society,” said Frenkel. “It promotes innovation, excellence and the pursuit of ever-more discovery – the hallmarks of Tel Aviv University. He described this year’s honorees as “shining examples of excellence across the breadth of endeavor. Among the attendees at the ceremony were Governor of the Bank of Israel Dr. Karmit Flug; Israeli Supreme Court Justices; Governors, Friends and members of academia. Speaking about the need to foster curiosity and originality, TAU President Joseph Klafter said that each of the award recipients was a “seeker of knowledge” in their own fields. “Whether in education, business, culture or public life, our exceptional honorees continue to expand the vistas of experience by questioning what’s been done before – and pushing resolutely beyond it,” he said. The George S. Wise Medal, commemorating Tel Aviv University’s founding President, was bestowed upon Ambassador Stuart E. Eizenstat, an international diplomat and attorney currently serving as Special Advisor to the US Secretary of State on Holocaust issues and Chief Negotiator for the Jewish Claims Conference with the German government. Eizenstat has held numerous senior positions under three US administrations, including Chief White House Domestic Policy Advisor to President Jimmy Carter, US Ambassador to the European Union and US Deputy Secretary of the Treasury. He has played a significant role in securing justice for victims of the Holocaust and advancing social causes, including in the areas of free trade, energy, security and climate change policy. Dr. Mario Draghi is one of the world’s foremost economists and economic policymakers, whose exemplary leadership as President of the European Central Bank helped to stabilize the euro and financial markets during the currency’s most critical period. He has served as a former governor of Banco d’Italia, Executive Director at the World Bank representing Italy, and as Director General of the Italian Treasury. Dr. Draghi has been a professor at the University of Florence and a fellow at the Kennedy School of Government of Harvard University, as well as a former Managing Director of Goldman Sachs International. ​Meir Linzen is an Israeli civic figure and legal expert in international tax and e-commerce. He is senior and managing partner of Herzog, Fox & Ne’eman Law Office – Israel’s largest law firm. As a leading tax expert he has extensive experience in advising multinational corporations on their investments in Israel. Mr. Linzen has a longstanding relationship with Tel Aviv University’s Buchmann Faculty of Law, his alma mater. He has served on the Executive Council of the Faculty’s Board of Trustees. He has worked tirelessly to bring in new friends and supporters to the Faculty and has shared his insight and expertise with new generations of legal scholars and practitioners. ​Prof. Eve Marder is the Victor and Gwendolyn Beinfeld Professor of Neuroscience at Brandeis University. She is best known for her pioneering work on small neural networks in crustaceans, which has revolutionized understanding of the structure and function of brain circuits. She is a member of the US National Academy of Sciences and former president of the Society for Neuroscience. She pioneered undergraduate study in neuroscience almost three decades ago and has been a dedicated teacher and mentor to generations of young researchers. Prof. Marder is the recipient of numerous prizes, among them the Kavli Prize in Neuroscience. She is a close collaborator with TAU’s Sagol School of Neuroscience. ​Prof. Günter Stemberger is a professor emeritus of Jewish studies and one of the world’s most eminent scholars on Roman and Byzantine and Talmudic literature. He is affiliated with the University of Vienna, where, among other roles, he headed the Institute of Jewish Studies. He has made a substantial contribution to strengthening the status of Jewish studies at universities throughout Europe and his seminal books have become essential reading for students in the field around the world. Prof. Stemberger is a member of the Austrian Academy of Science and has won numerous accolades, among them the 2010 Great Silver Award for Merit from the Republic of Austria. ​Raya Strauss Ben-Dor was co-owner and executive board member of the Strauss Group, one of Israel’s leading conglomerates. She currently serves as Co-President of Strauss Investments Ltd. Since her retirement, she has focused her efforts on philanthropic and social initiatives, particularly for residents of the Western Galilee. She was a founding member of Committed to Give, the first initiative for encouraging private philanthropy in Israel; served on the Board of Governors of the Jewish Agency and as World Chair of its Partnership2Gether program, and was a founding member of the Israeli branch of the JFN. She is a committed governor of Tel Aviv University and the founder of the Raya Strauss Center for Family Business Research on campus. Ratan Tata is one of India’s most influential business and philanthropic leaders. His illustrious career has spanned five decades at the Tata Group, including as its Chairman from 1991 until his retirement in 2012. Under his stewardship, the Tata Group grew to become an over $100 billion global corporation. Among his public activities, Mr. Tata serves as Chairman of two of the largest private sector-promoted philanthropic trusts in India and as Chairman of the Council of Management of the Tata Institute of Fundamental Research. He is the recipient of many national and international accolades, among them an honorary knighthood, and has been instrumental in strengthening academic, business and strategic ties between India and a range of countries including Israel. He is a supporter of the Momentum Investment Fund at Tel Aviv University and the Tata Fellows Scholarship Fund. ​Prof. Qiu Yong is President of Tsinghua University, China, and one of China’s most celebrated chemical scientists, educators and inventors. His research on organic light-emitting diodes serves as the scientific basis of Visionox, a Chinese high-tech company with 2,500 employees and over 1,700 patents. Alongside TAU President Joseph Klafter and TAU Honorary Doctor Ronnie Chan, Qiu co-chairs the China-Israel Innovation Forum, which is dedicated to promoting academic, industrial and governmental collaboration between the two countries in the fields of technology and innovation. Prof. Qiu is an elected member of the Chinese Academy of Sciences and the recipient of numerous honors including the State Technological Invention Award conferred by the President of China. ​Habima National Theater of Israel was the world’s first professional Hebrew theater, originally established in Moscow 100 years ago in 1917. An Israeli cultural icon, Habima has made a seminal contribution to revitalizing Hebrew culture and language in general, and to enriching the cultural scene of Tel Aviv, the first Hebrew city, in particular. It has nurtured generations of Israeli playwrights, directors, actors and designers. Today, Habima comprises a troupe of over 80 actors and 120 theater arts professionals who put on dozens of productions per year and participate in top festivals around the world. 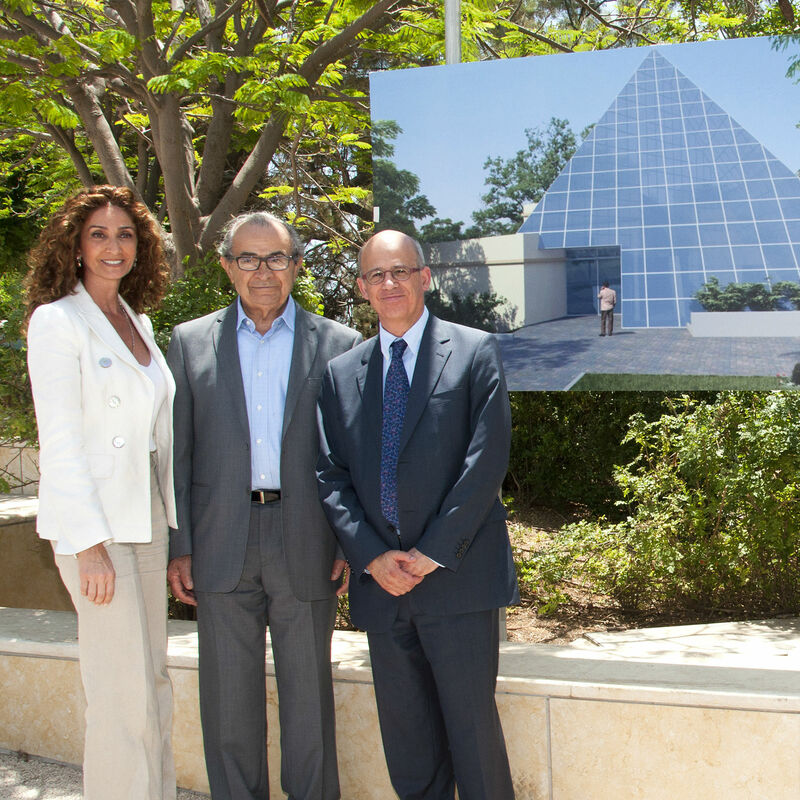 The Fellowship was received by Habima representatives Odelia Friedman and Moshe Kaftan. ​Shira Shofty is the outgoing Director of the Dov Lautman Unit for Science Oriented Youth at Tel Aviv University. Founded in the 1960s, the Unit is dedicated to nurturing excellence and expanding accessibility to higher education among talented youngsters, with an emphasis on the country’s social and geographic periphery. 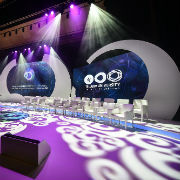 Under Shofty’s leadership, the Unit was transformed into the largest center of excellence of its kind in Israel and has played a major role in preparing new generations of youngsters for future leadership roles throughout Israel’s military, industrial, educational and academic spheres. In recent years, Shofty has focused much of her efforts on helping Israelis of Ethiopian origin integrate into Israeli society.